Expansive, indeed. This morning I woke to the sound of an avalanche blasting down Nuptse. It was too high on the mountain to squash tents, but it definitely rearranged the scenery. Closer to home, the sun has transformed Expedition Hanesbrands’s site from an ice cube into a braided stream. 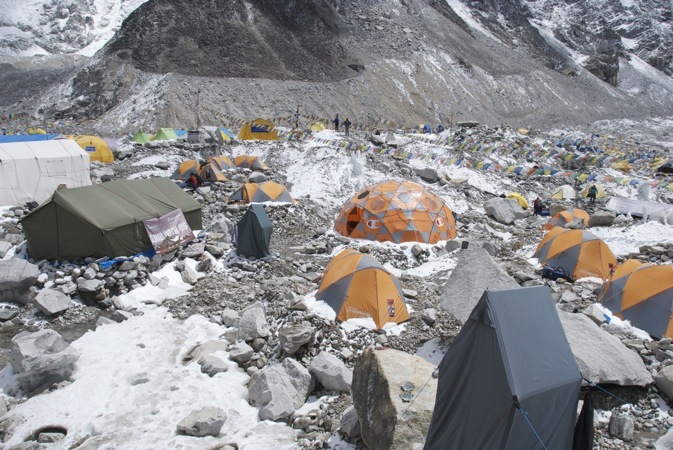 And most of the 300-plus climbers who have paid a lot of money to go up the mountain have migrated farther down valley to rest and wait for a decent summit window. 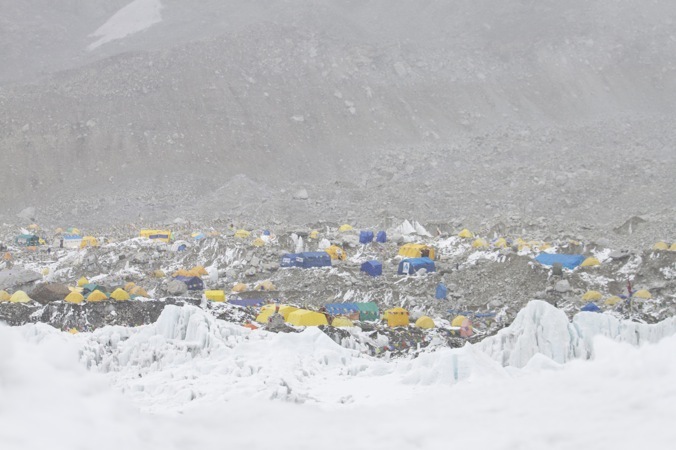 Like any dense metropolis, it takes at least an hour to thread through this shape-shifting tent city of approximately 1,000 climbers, guides, Sherpas, and porters set on the Khumbu Glacier at the base of Mount Everest, Mount Pumori, and Nuptse. The official entry is at the wind-bitten “Everest Base Camp: 5,364 m” sign, which hangs from a rock cairn strewn with hundreds of disintegrating prayer flags, photographs, and inscriptions left by trekkers. 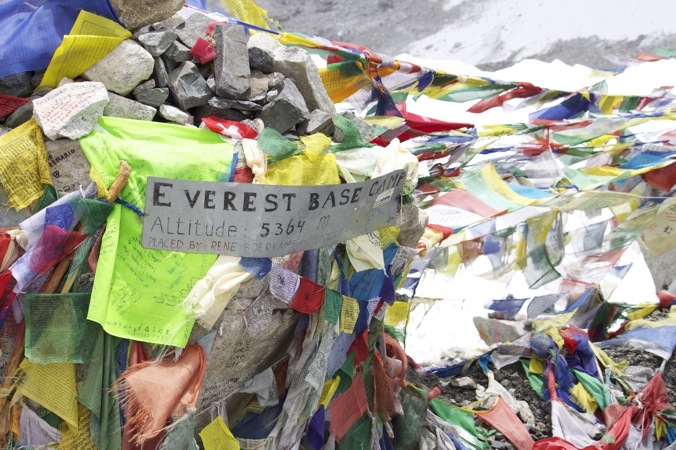 The sign is like Mecca for high-altitude trekkers. From here, an exurb of Base Camp proper, it takes approximately 25 minutes to walk up, down, and around the glacial boulders and scree to arrive at our camp, set in a protective basin right in downtown EBC. Some Sherpas who work for big guiding companies arrive here as early as January to stake their claim and carve out their own slice of high-altitude heaven. Search hard enough and you can find soda-making machines, generator-operated freezers, flat screen TVs, massive cuts of Norwegian salmon, and the largest stash of Fudgee-Os outside of Canada. Our own compound has a yellow-domed yoga tent, strewn with colorful Asian rugs. 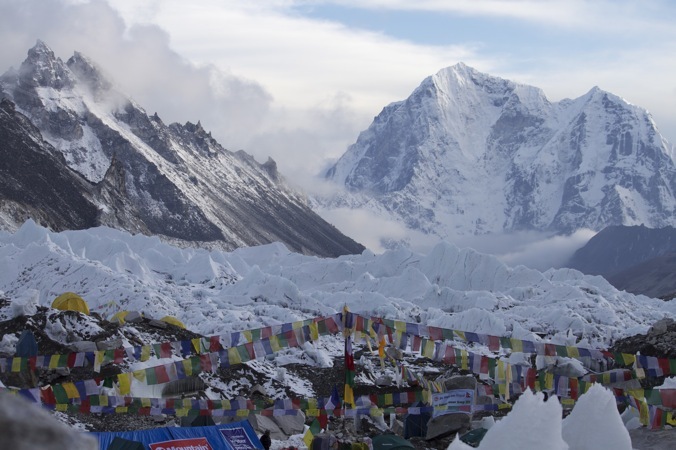 If yoga at 17,500 feet doesn’t sound appealing, we can always play the Mountaineering edition of Monopoly or watch a “Mortal Kombat” DVD with the Sherpas. Each camp varies in size and luxury, but every one is guaranteed to have two necessary items: First, there will be a poop-only outhouse, which consists of massive hole in which a blue barrel is placed. As part of their expedition cost, clients pay a fee to ensure that this solid waste will be removed by porters who come at odd hours of the day to remove old barrels and replace them with fresh ones, then trek down valley to discard the solid waste. 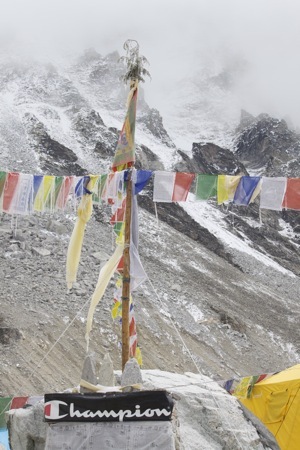 The second mandatory item at each site is a puja, a Buddhist altar made of rocks and strung with prayer flags where climbers and Sherpas burn juniper as an offering to Buddha before they ascend the mighty mountain. “Your stomach might be worn thin, worn out,” he says, prescribing a medication that will help. 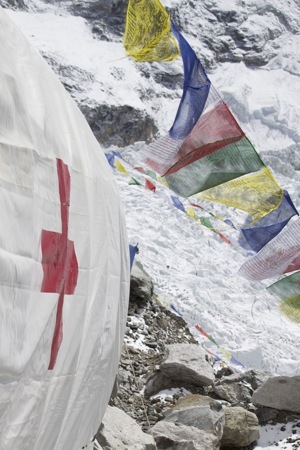 A consultation for Nepali Trekkers and porters cost 200 Nepali rupees, roughly $3. 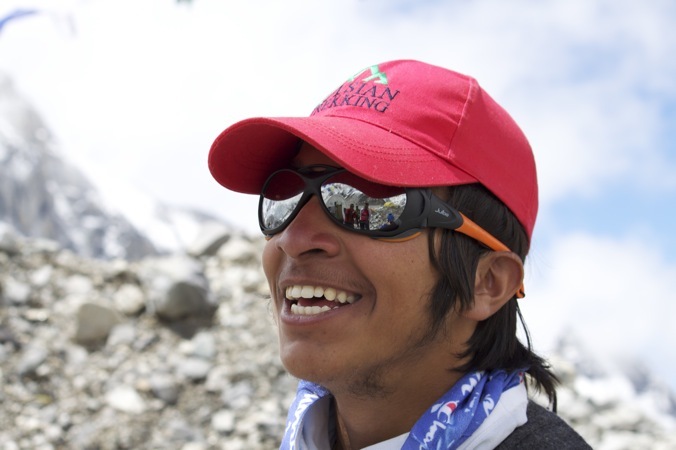 The next patient is an Indian kid named Arjun Vhapai, who just happens to be the youngest non-Sherpa, at age 16, to attempt to summit Everest. He’s here for a routine checkup before leaving in next few days for his summit attempt with Apa Sherpa, the man who holds the world record for the most summits. 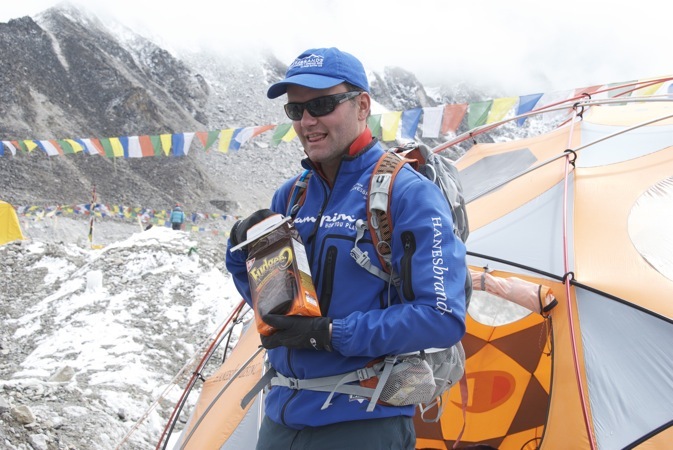 “Do you feel pressure being the youngest person ever to try to climb Everest?” I ask. Later in the day we hike back out to the Base Camp ‘burbs so Jamie Clarke can stretch his legs and blow off a little steam while he waits for a summit window to open. On our way out of camp, we see a group of about 20 men, some Westerners, some Sherpas, trying to heave a refrigerator-sized boulder off a cliff. The exercise wasn’t out of sheer boredom. 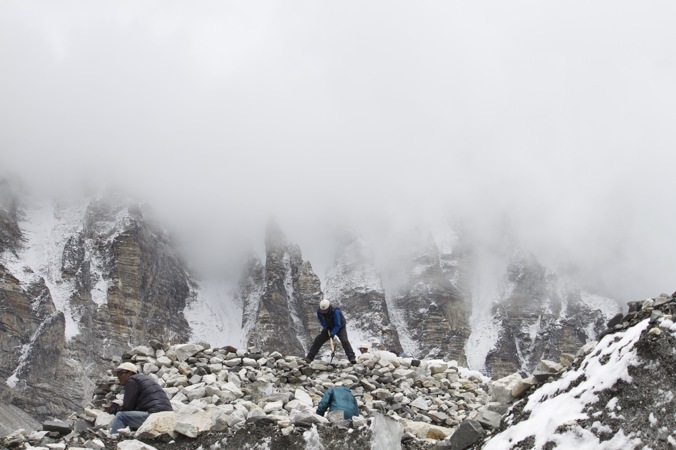 Russell Brice, the owner of commercial operator Himalayan Experience, and Mark Tucker from RMI, were leading the charge to build a new helipad farther away from Base Camp so helicopters would stop buzzing the climbers’ tents—a major complaint this season. 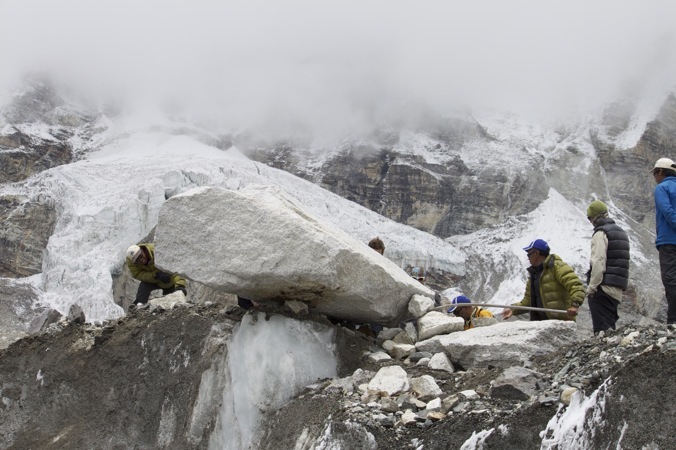 After about 20 minutes of chipping away at the ice below the boulder, the guys gave one last heave-ho, then fling the massive rock off a 20-foot cliff. Later on I pay a visit to Brice’s camp, one of the more luxurious sites way out in the Base Camp ‘burbs. At its heart is a heated white dome straight out of James Bond with tiger rugs, a bar with an espresso maker, and a decent stereo system. Brice picked the way out location to keep his 19 clients as healthy as possible. “We like to camp here because it’s unhygienic up there,” Brice, who has been running guided expeditions on the mountain since 1994, told me.